The Estacada Rangers have a knack for winning close games, and they proved it once again on Friday evening. Nick Keller and Gabriel Martinez each scored a pair of rushing touchdowns to help give the host Rangers a 28-20 win over Crook County, which was hamstrung by a slow start offensively. "It was obviously a tough loss," Crook County head coach Ryan Cochran said following the game. "We played three teams that were really highly ranked, and we played them all really tough, so it was tough to once again come up a little bit short." It was the fifth time this season that Estacada had won a game by single digits and the fourth time that the Cowboys have lost a game by single digits. "It felt like we were in complete control at times, we just didn't finish. Crook County hung around for a while, but we made some big plays at the end to get the win," Estacada head coach Andy Mott said. Crook County got the ball to start the game and immediately took a deep shot downfield. Quarterback Brody Connell threw a beautiful ball down the sideline to a wide open Garett Bernard, but Bernard could not pull it in and a drive stalled. Estacada's veer rushing attack looked like a machine in the first quarter as they steamrolled Crook County on their opening possession. After a pair of first down runs by Martinez, Keller kept the ball on an option and ran it down to the 1-yard line. Two plays later, Keller would punch it in and then run for the conversion to put the Rangers on top 8-0. Estacada would get into the red zone on their following drive but would turn the ball over on downs after Keller's pass intended for Logan Stamm fell incomplete. But another three-and-out for the Cowboys offense gave Estacada the ball right back. Stamm and Sam Garrison would get in on the offensive action with a pair of first down runs to get the Rangers inside the 5-yard line. Keller would take it from there as he scored on a quarterback sneak to increase the Estacada advantage to 16-0. After three consecutive three-and-outs, the Cowboys finally got a first down with 4:27 left in the second quarter after an 8-yard run by Connell, but the drive was later negated when Connell threw a pass that was intercepted by Kaden Settle. However, Crook County caught a glimmer of hope on the following play when Estacada fumbled the ball away inside their own 20-yard line. Erick Gonzalez recovered the fumble, and the Cowboys were in business. The Cowboys moved the ball quickly inside the 10-yard line, where Gonzalez scored on a 9-yard run. Connell's kick was blocked, but Crook County was back in the game, trailing just 16-6. Estacada responded with a clock-eating drive of their own, finally scoring on a 2-yard run by Martinez. The two-point conversion attempt was no good, but the Rangers were rolling, holding onto a 24-6 lead late in the first half. Crook County quickly answered on the ensuing possession with Connell hitting Dominic Langley on a 48-yard touchdown strike. The two-point conversion attempt was no good, but the Cowboys were once again back in the game, trailing 22-12 at the half. Estacada took the kickoff to open the second half and immediately went on a long time-eating drive. The drive eventually stalled, and the Cowboys quickly scored on their next possession, pushing the ball across the goal line on a Jason Slawter 12-yard run. Connell carried the ball across the goal line for the two-point conversion as the Cowboys closed to within two points at 22-20. Estacada then went on another long drive, ending the third quarter. "We didn't have the ball much in the third quarter," Cochran said. "We scored really quick when we got the ball, but they chewed up the clock quite a bit. They were putting up some long extensive drives in the quarter." Estacada continued the drive into the fourth quarter, capping off a long drive with a final touchdown as Keller carried the ball four yards for his second touchdown of the game. The two-point conversion failed, but the Rangers still led by eight. With time running down, the Cowboys went to the air but were unable to score, and Estacada was eventually able to run out the clock. "Our kids gave everything they had," Cochran said. "They sold out, and they played to the very last second. It was a tough loss, but on the other hand, I was proud of their effort and them never rolling over. They kept scrapping and kept fighting." Estacada finished the game with 484 yards of offense, while the Cowboys could manage just 218. The Rangers amassed 438 yards rushing, dominating time of possession with their powerful rushing attack. Connell was 8 for 16 passing for 118 yards, one touchdown and one interception. Connell also led Crook County's rushing attack, carrying the ball 10 times for 63 yards. Langley caught six passes for 89 yards and a touchdown. The Ranger defense held the remainder of the Cowboy offense to just 37 yards rushing. Gonzalez led the Cowboy defense with 13 solo tackles, two assists and the one fumble recovery. Slawter also had a great defensive effort with 11 solo tackles and six assists, while Hunter Bishop had nine tackles and three assists. Connell was also active on defense with seven solo tackles, two assists and a fumble recovery. With the victory, Estacada improved to 7-1 overall and 4-1 in Special District 2. The Rangers have earned the districts second automatic seed into the first round of the playoffs and must now sit and wait the results of this weekend's play-in round to see who they will play. Meanwhile, the Cowboys fell to 3-5 overall and 1-4 in conference play and have been eliminated from post-season consideration. Despite the loss, Crook County nearly earned a play-in berth. The Cowboys finished the season ranked 21st in the final OSAA power rankings of the season, and the first 20 teams all earned either a bye into the playoffs, or a play-in game. Special District 2 has proved to be one of the toughest conferences in the state, with four of the six teams qualifying for post-season play. 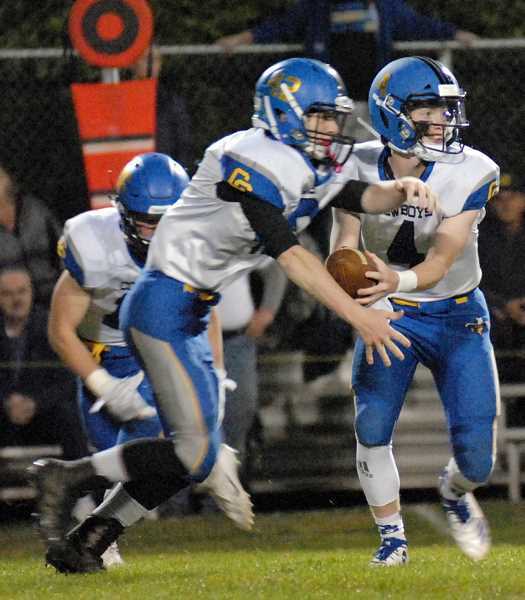 Gladstone won the district championship with a 30-28 victory over Woodburn Friday night, earning a guaranteed home game for the first round of the playoffs. Woodburn and North Marion also advanced to post-season play as both earned home play-in contests. E - Nick Keller 1-yard run, two-point conversion Gabriel Martinez run good. E - Martinez 4-yard run, Martinez two-point conversion run good. CC - Erick Gonzalez 9-yard run, kick blocked. E - Martinez 2-yard run, two-point conversion attempt no good. CC - Brody Connell 48-yard pass to Dominic Langley, two-point conversion attempt no good. CC - Jason Slawter 12-yard run, Connell two-point conversion run good. E - Keller 4-yard run, two-point conversion attempt no good. Matt Rawlings of the Estacada News contributed heavily to this story, including detailed information and a portion of the writing.